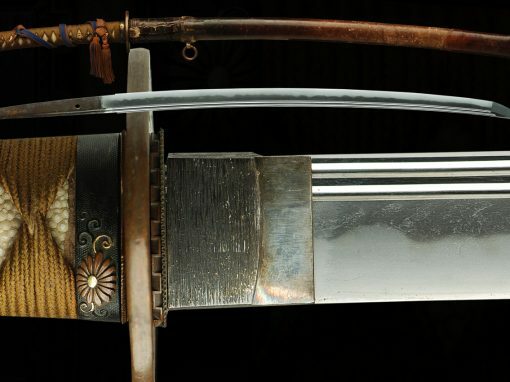 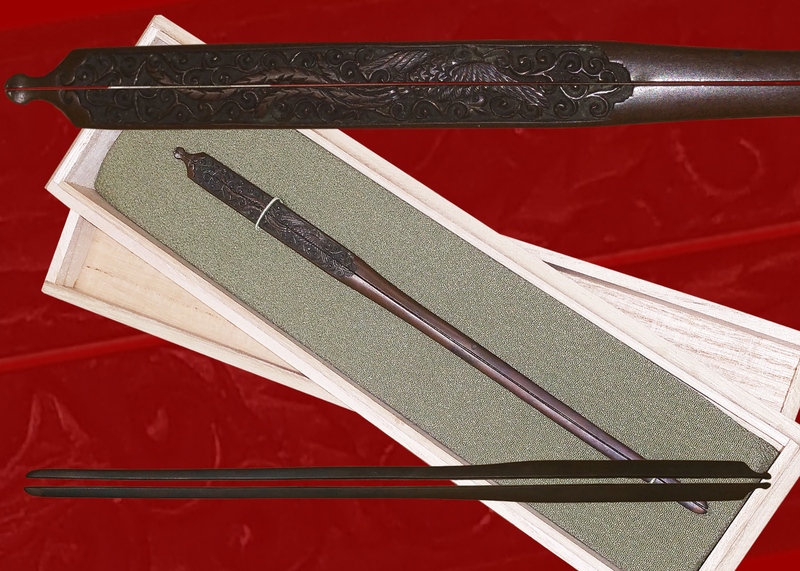 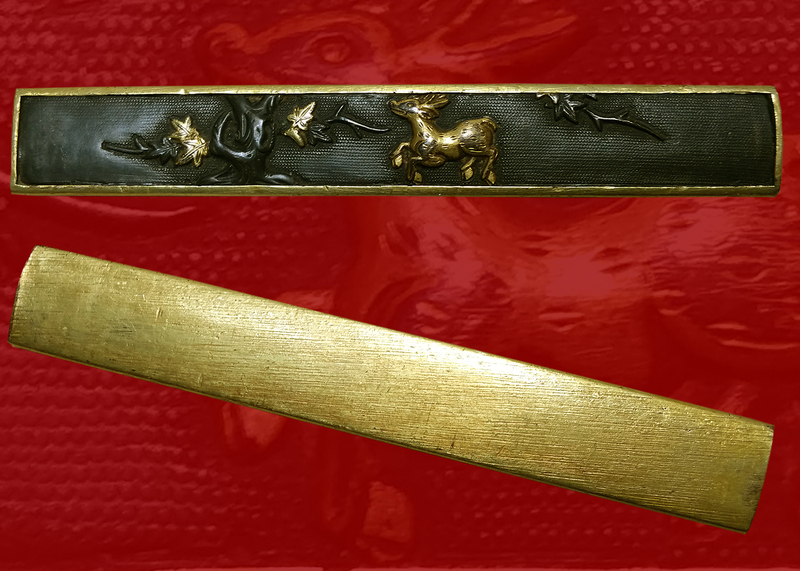 This is a very fine example of a sword made by the first generation Tadakuni. 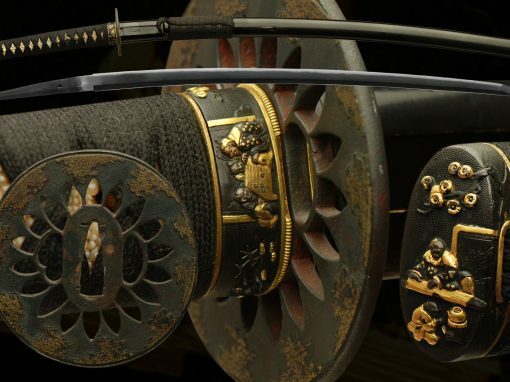 The hada is very beautiful and the overall shape of this sword is very elegant. 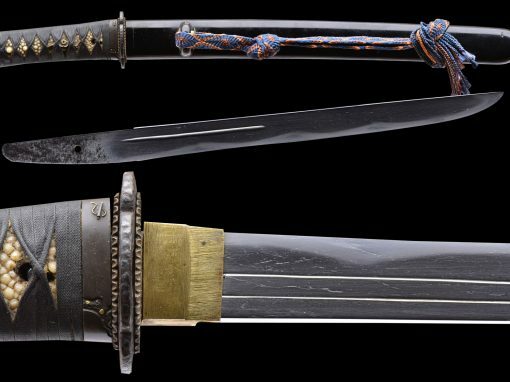 This smith also had the title of HARIMA NO DAIJO. 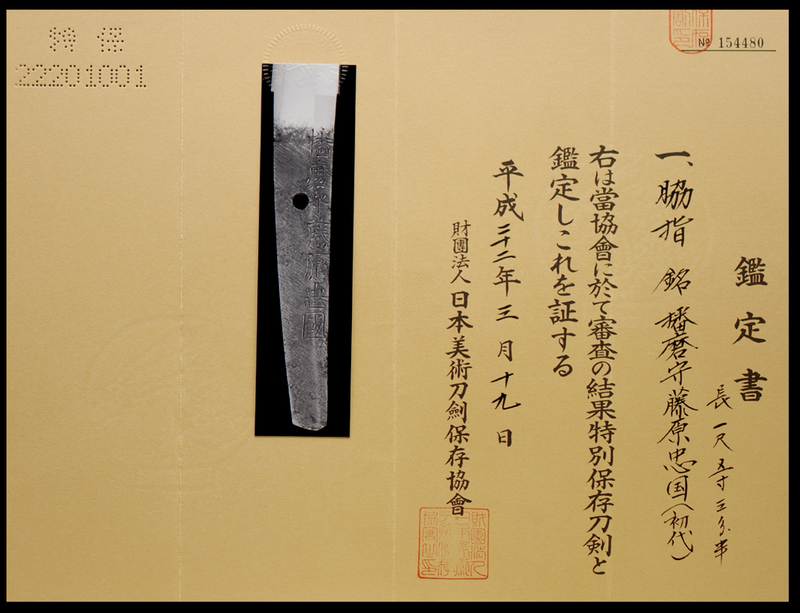 He was in the Shodai Tadayoshi Mon, and worked around Kan’ei (1624-1644). 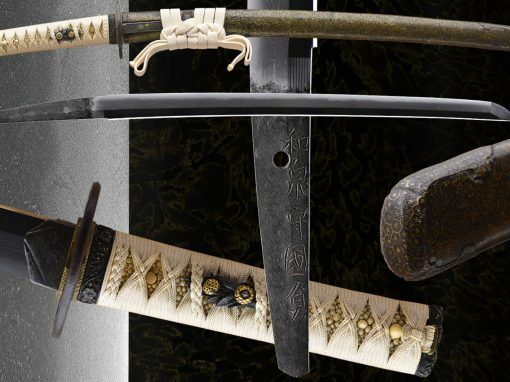 The Nidai Tadakuni also had the Title of Harima no Kami, but most of the swords signed that way are by the Shodai in his later years. 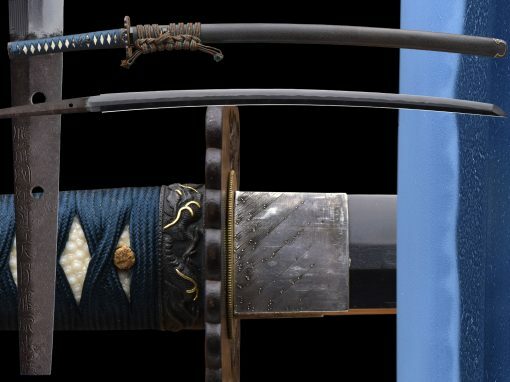 Hirosada was a Hizen swordsmith and half brother to Shodai Tadayoshi. 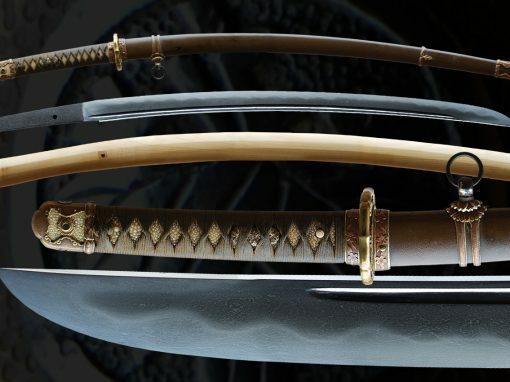 During the rise of Tadayoshi, he likely studied under the Shodai and changed his name to Yoshiie, taking the last half of Tadayoshi’s name. 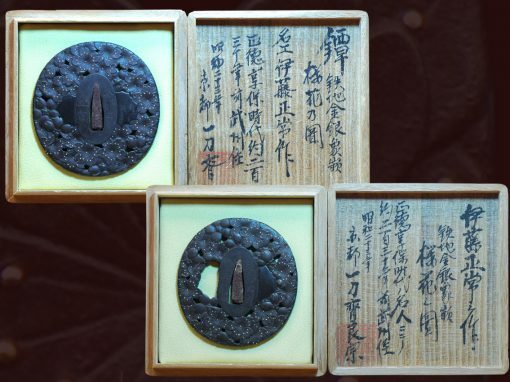 His own sons in order of birth were also students of the Hizen school: Kunihiro, Hironori, Hirosada (nidai), and Munehira. 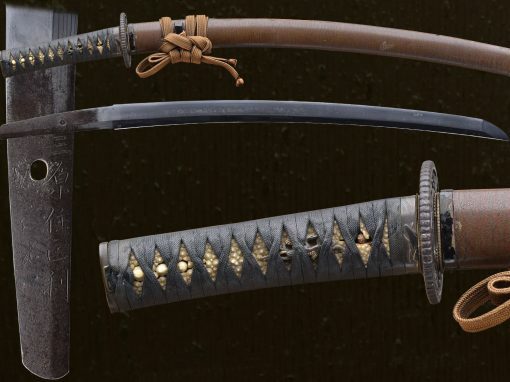 The pattern of these names shows that they probably began independent work before Hirosada changed his name to Yoshiie.Hironori was the second son, his civilian name was Hashimoto Rokurosaemon, and he was born in 1597. 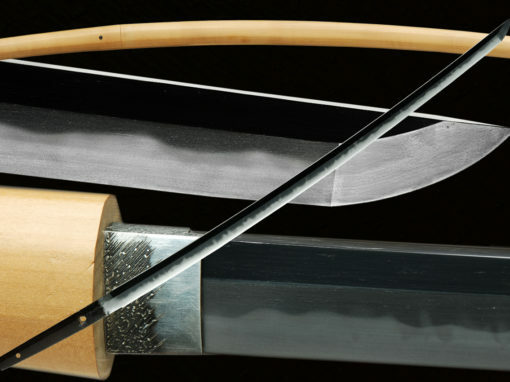 He was old enough to train directly under Shodai Tadayoshi who died in 1632 when Hironori was 35 years old. 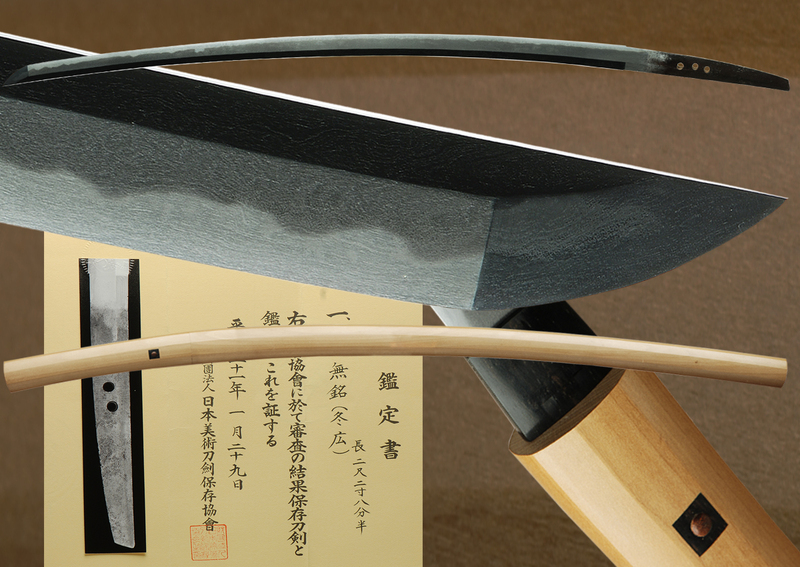 At some point before Tadayoshi died, Hironori he received the Tada character used throughout the Hizen Tadayoshi school and took on the new name Tadakuni.Tadakuni is known for a gorgeous midareba as well as works done in the tradition Hizen style of suguba. 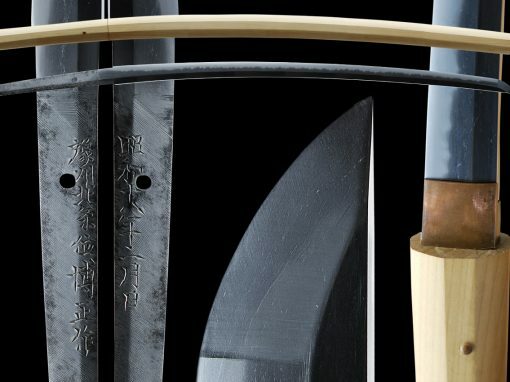 He is known for making very sharp blades and some of his work carry cutting tests from various masters proving their sharpness. 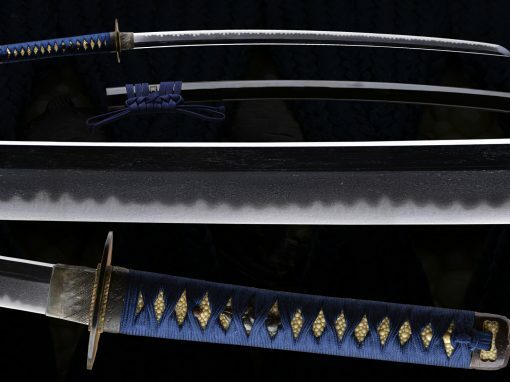 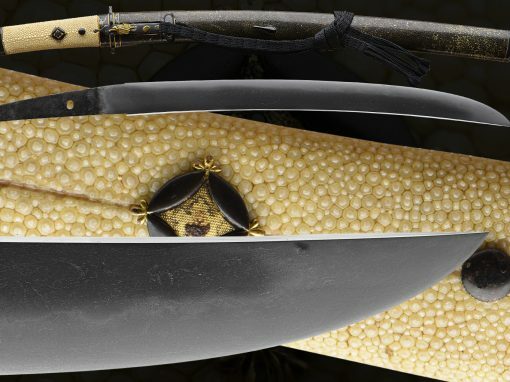 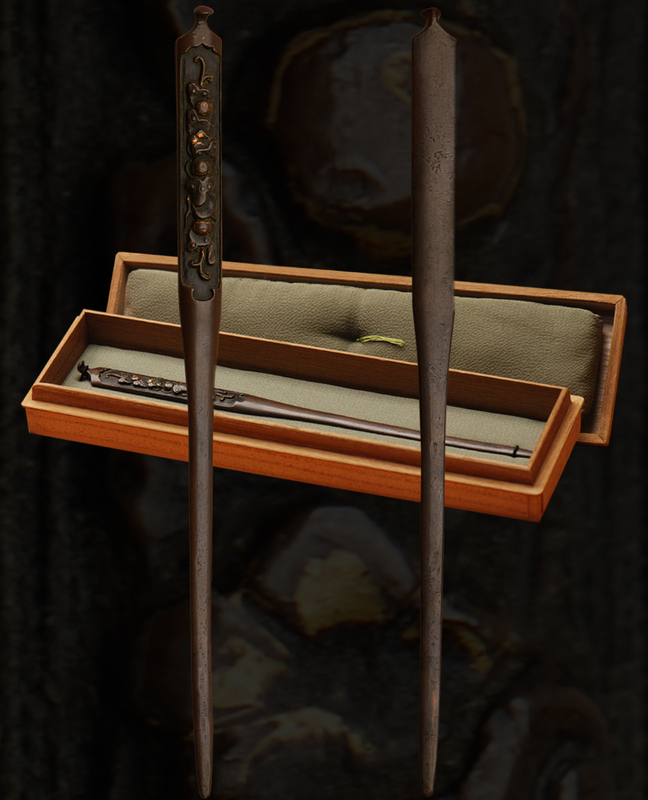 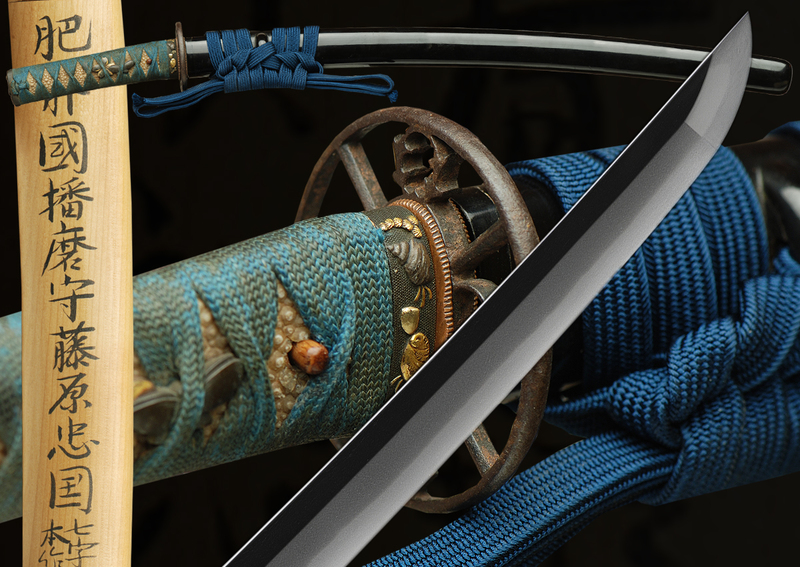 Hizen swords in general carried a great reputation as both beautiful items and excellent cutting sword.Books usually say that the first generation Tadakuni used the title Harima no Daijo and the second generation is Harima no Kami. 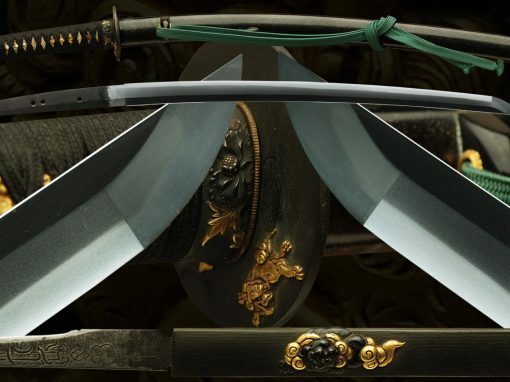 According to the NBTHK Juyo Zufu, the first generation used Harima no Kami at the end of his life. 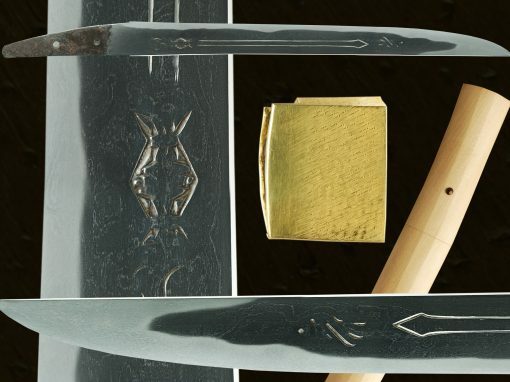 Fujishiro states that the second generation sometimes used Botan and Kiku mon in the nakago, but again we see this in Shodai Tadakuni’s late work and most of those that have passed Juyo seem to all have notes that they are the work of the Shodai. 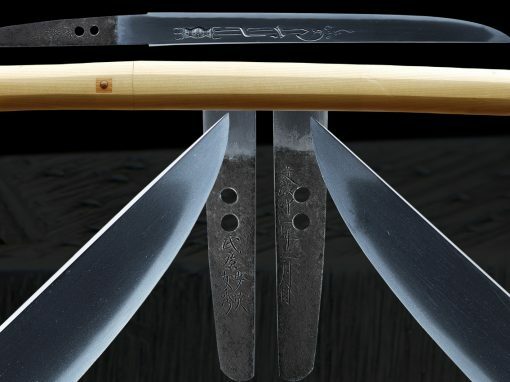 Tadakuni is a smith of great skill, ranked Jo-saku by Fujishiro and carrying the Wazamono rank for great cutting ability. 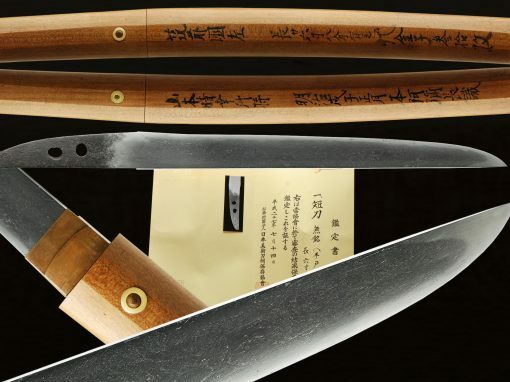 He left behind 30 Juyo works, two of which bear cutting tests. 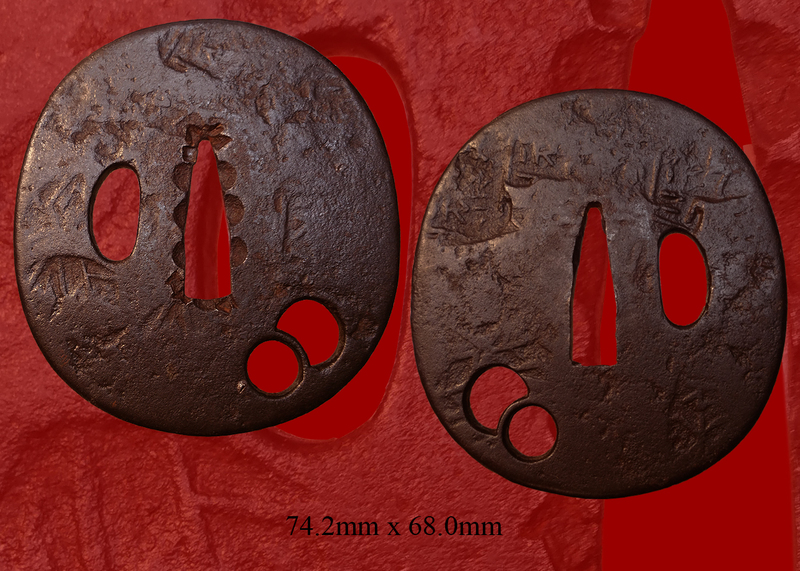 Tadakuni died in 1691, at the age of 94, and at least four smiths would follow him using this name. 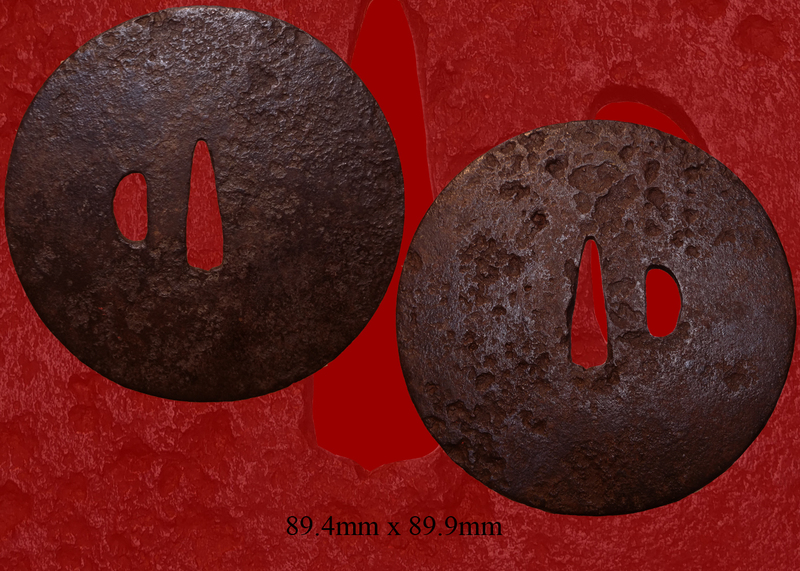 Email us if your interested in this item and remember to include the order number for this item: fss-803. 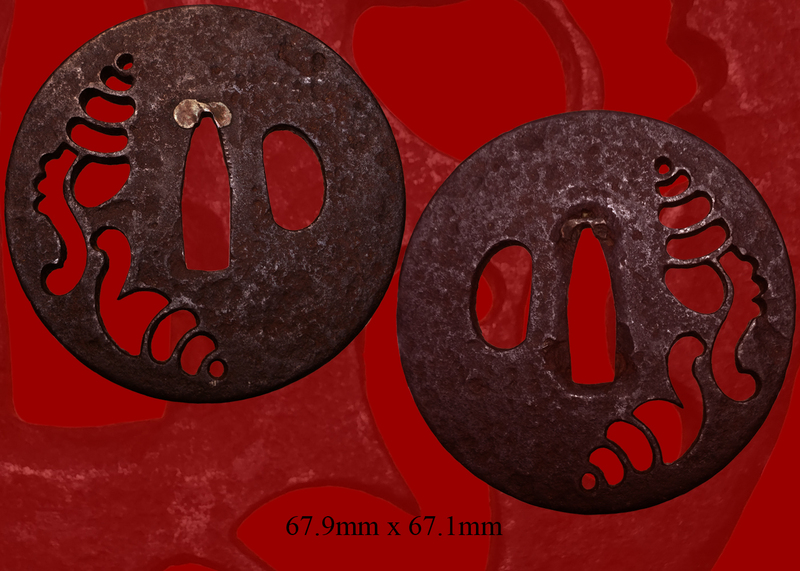 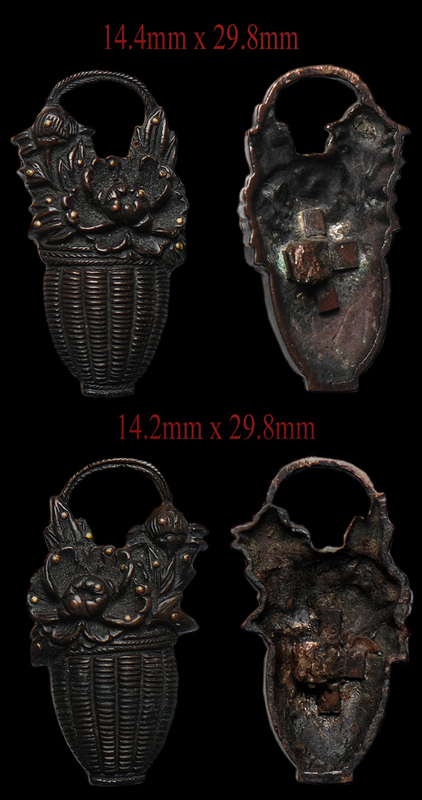 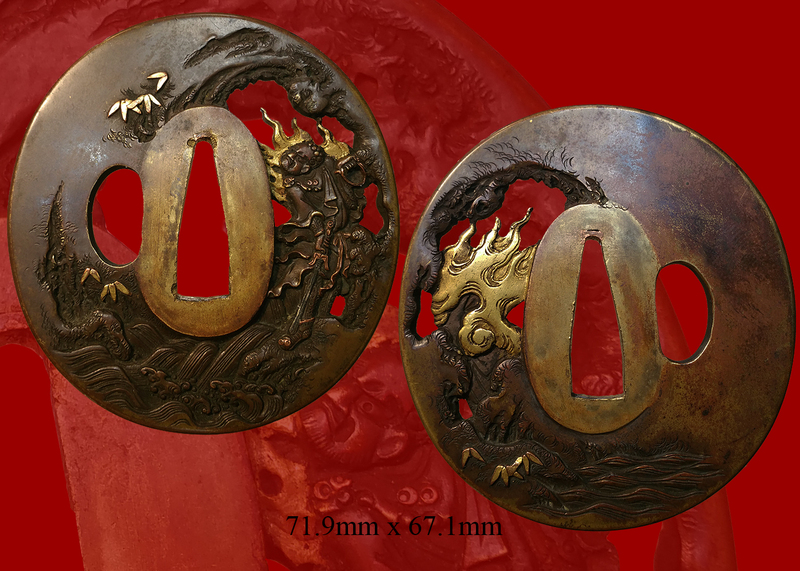 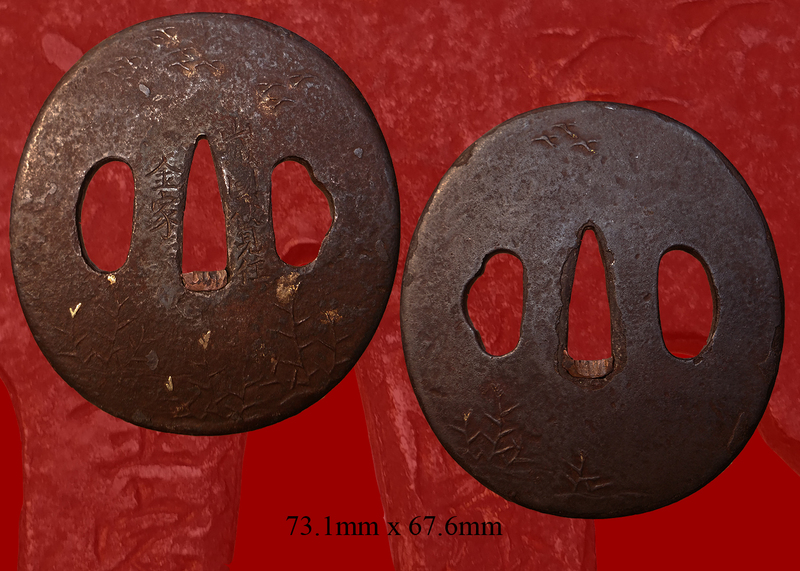 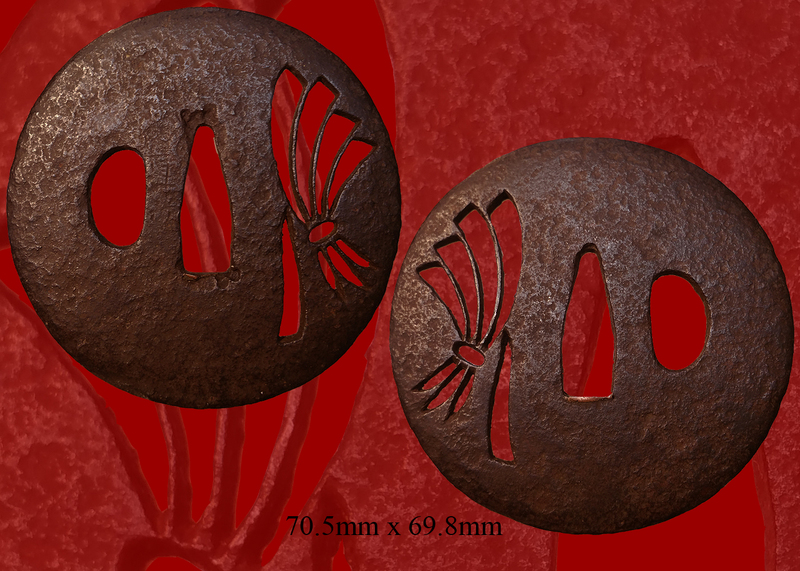 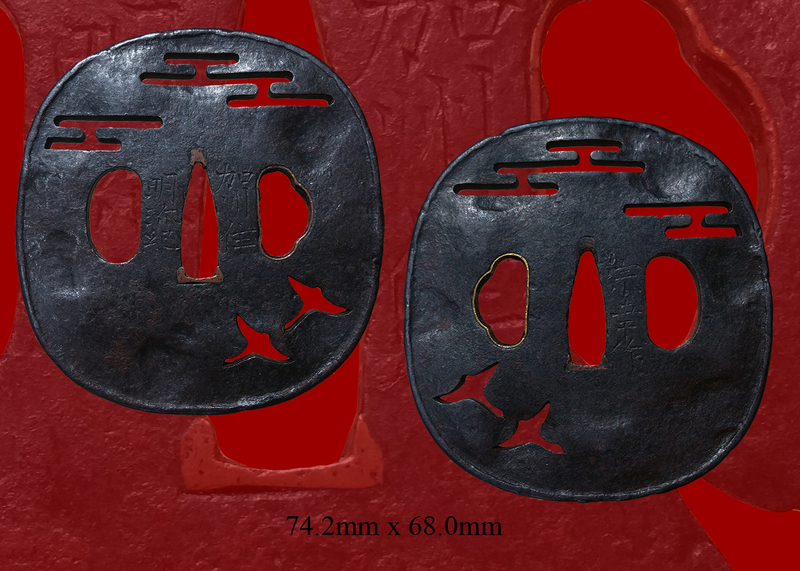 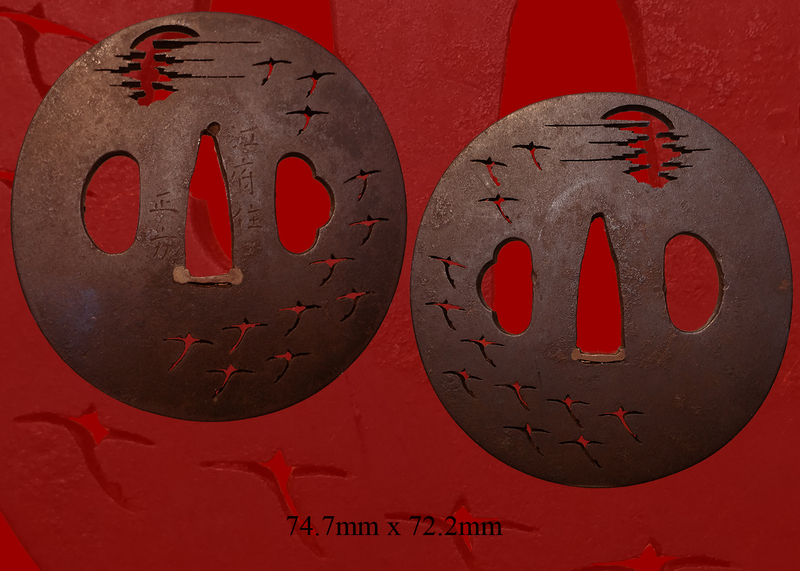 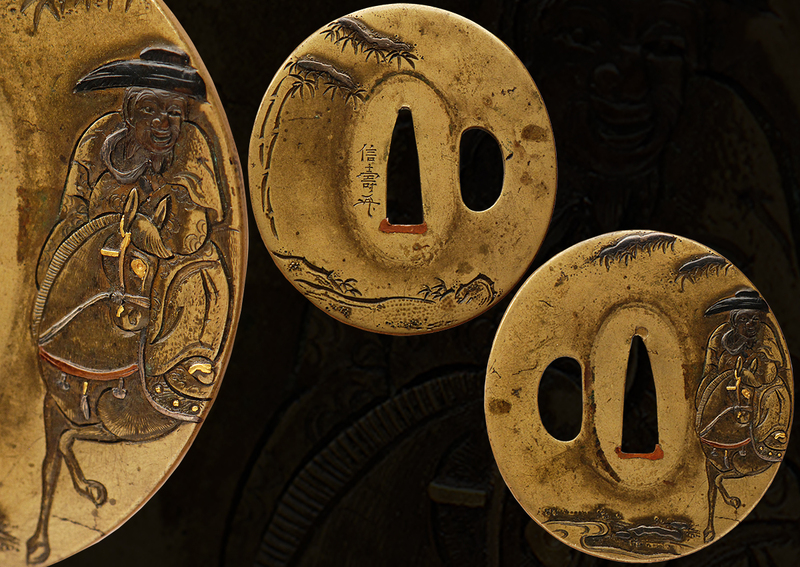 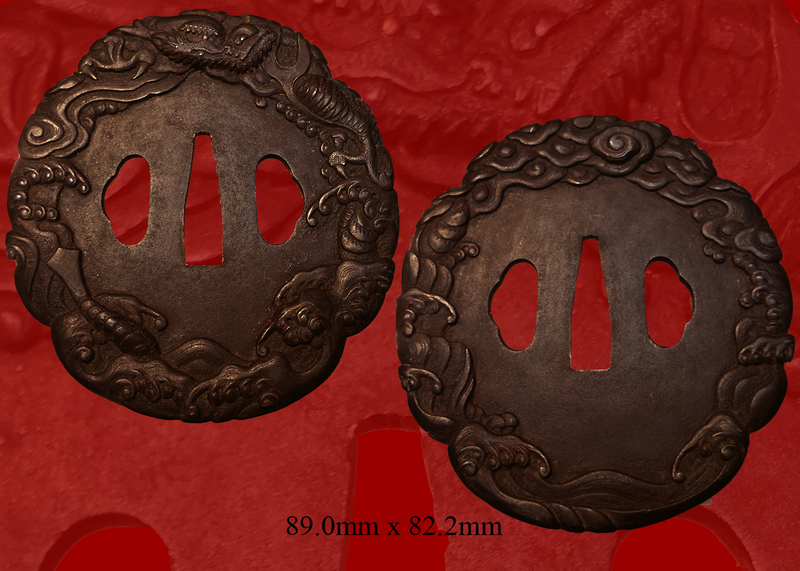 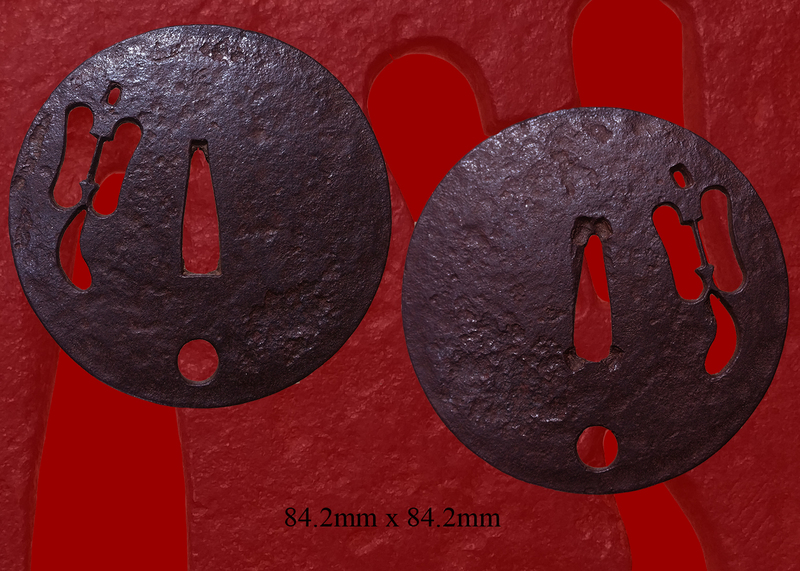 As a result of a shinsa at this organization, the above item has been designated a TOKUBETSU HOZON TOKEN, and is confirmed as authentic. 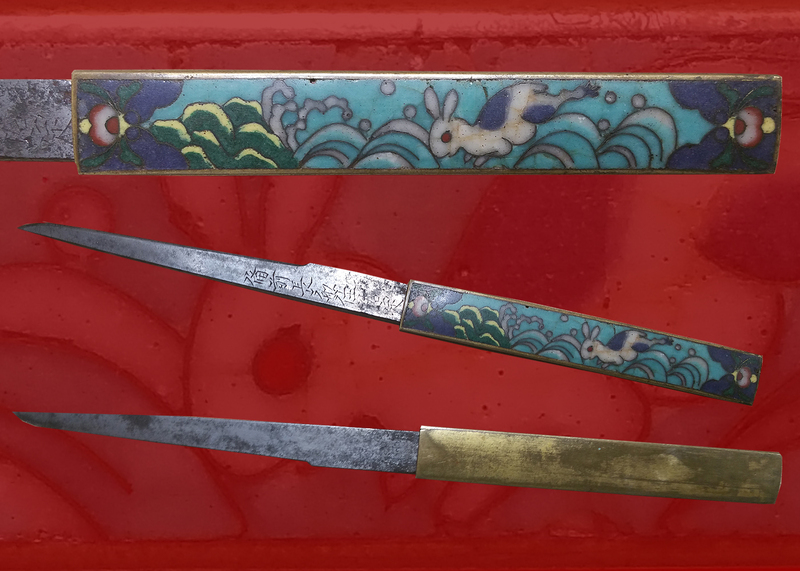 It is unusual for the NBTHK to name the generation, but they have on this sword of TOKUBETSU LEVEL. 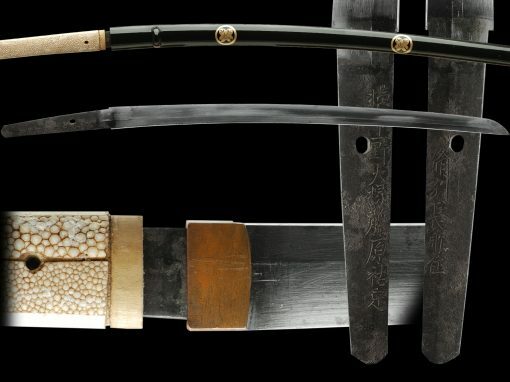 It is made from the first generation of this line of smiths. 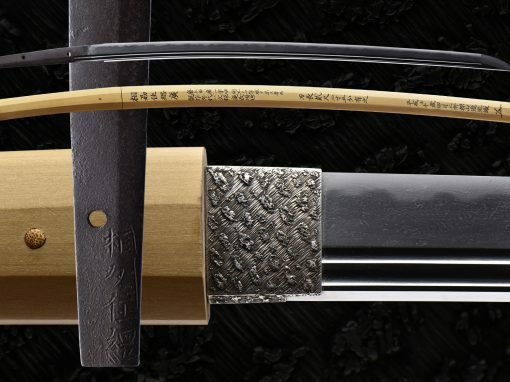 This important sword comes in fresh polish, new silver habaki, shirasaya and with high level tokubetsu papers from the NBTHK.